I'm very happy to announce the first ever SpilBar in Viborg! Participating in SpilBar is free of charge, and with monthly events in Viborg, Aalborg and Aarhus. 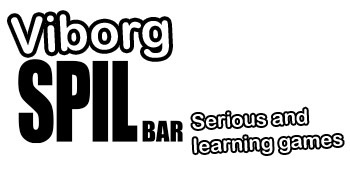 SpilBar is an event aimed at all the game producers, students, developers and enthusiasts out there. SpilBar is a great opportunity to meet new and old friends, colleagues and a chance to learn from the best. How do you create learning games, and what should you be aware of before doing so? What is the difference between learning and serious games? And how can they be used? These are just some of the questions we will try to answer at the first SpilBar ever in Viborg! Lars Henriksen is CEO & Partner of Apex and has been involved in many political and financial initiatives within the sector. Apex is one of the companies who has been successful in using game development and technology for both Game as entertainment as well as working on games for more serious purposes. During his talk, Lars will talk about how they work at Apex Virtual Entertainment both with more traditional entertainment games, as well as games with serious applications - and how they manage to do both within one game studio. After this, Lars will take us through the development process of creating games with serious applications, using the “Games for Health” project as a case study. The “Games for Health” project is a two-year research and development project focused on using game technologies to treat PTSD. Finally we’ll have an open Q&A session with the audience. Henrike has a B.Sc. in Media and Computing, and is currently working on her master thesis of Game Design at ITU Copenhagen. Her thesis project “Machineers” aims to teach children age 10-14 about programming by playfully introducing programming concepts and logic through puzzles and gameplay elements. In the “Learning by Playing” talk Henrike will talk about the journey of making an educational game for kids as a student project, the challenges they have faced in production and testing and how the project is going at the moment. Sort of a post-mortem of a game in progress.